Lumps can occur anywhere in the mouth: lips, gum tissue, cheeks, tongue, or palate. Such lumps or masses may develop quickly or gradually over months or even years. Some remain the same size and do not change their characteristics while others change in size, color, and symptoms such as pain. Most are benign masses and are not serious. 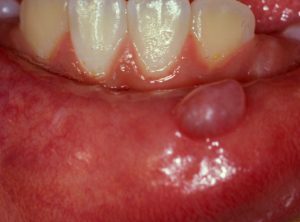 A benign swelling that commonly occurs in the lower lip. A variation that forms in the floor of mouth under the tongue is called Ranula. 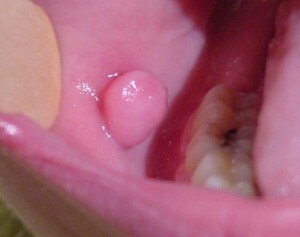 It is due to ‘leaky’ ducts of damaged minor salivary glands of the lower lip. It often changes in size and recurs until treated. Treatment is complete excision of the lesion along with the damaged minor glands. Some masses are inflammatory due to either bacterial or viral infection. 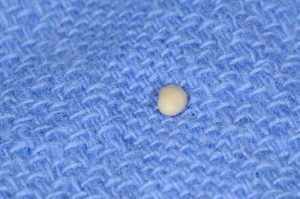 One common form is known as granuloma. Treatment is complete excision and biopsy. 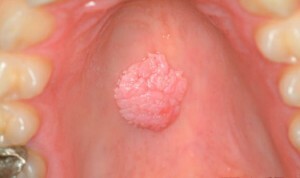 It is a soft lesion with a thin attachment to oral mucosa.